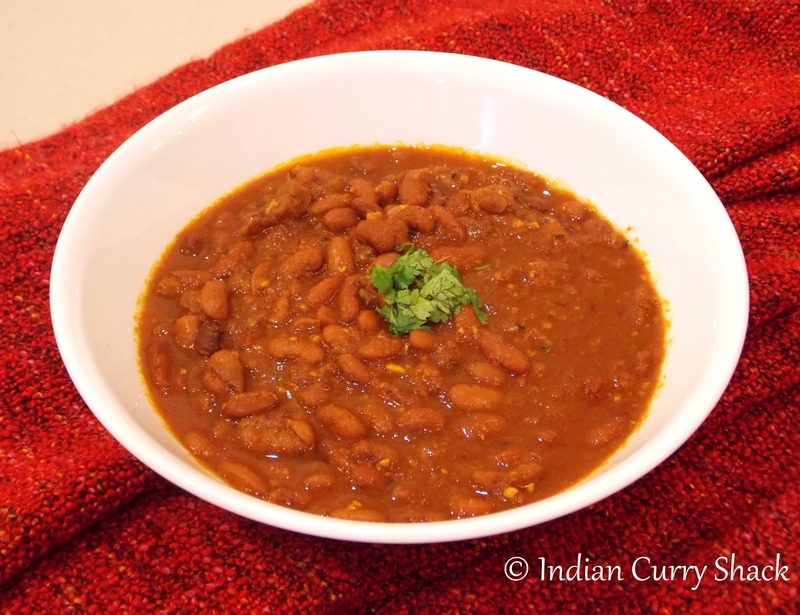 A popular red kidney beans curry of North India. Tastes excellent with steamed rice. Sounds elaborate but it’s a very easy and super delicious dish. If you are working you can do something what I did and make it a comforting dish. Before leaving for work in the morning, I soaked a cup of Red Kidney Beans (Rajma) in about four cups of water and covered with a lid. That is the first and the most important step. You can even soak it overnight and cook it the next morning. Read on… for the remaining steps. Trust me, it’s not a big deal to champion this delicacy. Though I couldn’t say this till I had my hands on it the very first time and since then I have relished it every time. Place the soaked red kidney beans (Rajma) in a pressure cooker with 4 cups of water (the one in which it was soaked), 1 cinnamon stick, 1 green cardamom, 1 black cardamom and a pinch of salt. Cook under pressure for six to eight whistles or till the red kidney beans are completely cooked and soft (taste one or two beans and ensure it’s soft, otherwise pressure cook again for a few more whistles). Keep it aside. Heat oil in a pan and add cumin seeds. Add chopped onions after the cumin seeds start crackling. Sauté till light brown. Add ginger, garlic and stir-fry for half a minute. Add tomato and green chilli puree and cook on medium heat for three to four minutes, stirring continuously. Now add rajma masala (or garam masala), turmeric, red chilli powder and salt and continue to sauté for two minutes. Mash a handful of boiled red kidney beans and add it to the masala. Stir for a minute. Add the remaining boiled red kidney beans along with the cooking liquor and mix. Add a cup of water if the mixture looks very thick and cook on high flame for 2 minutes and then simmer for 3-4 minutes. You have your perfect Punjabi style Rajma ready. Garnish it with chopped coriander leaves and serve hot with steamed rice and your favourite pickle. I love it with home-made mango pickle and natural yogurt on the side. It indeed was. 🙂 Thanks so much! Hi there! I’m so pleased that you liked the recipe! 🙂 Rajma with steamed rice has always been a favourite at home. This recipe tastes just as good (even better!) the following day after reheating properly.